The 9th annual Legacy Genealogy Cruise, to be held May 12-21, 2012, starts and ends in Oslo, Norway, and visits the following ports: Le Havre (Paris), France; Cherbourg, France; Dublin, Ireland; Liverpool, England; and Edinburgh, Scotland. We will sail on Royal Caribbean's Vision of the Seas ship. Attend our webinar, Crusing with Legacy Family Tree in 2012 on Friday, June 3 to have all your questions answered. Register here for the free event. With so much for you to see and do, Northern Europe is an explorer's playground. Tour majestic castles and elegant grand residences. Stroll through historic town squares and world-class museums. Whatever you decide to do, one thing is certain - your Northern European cruise will be an unforgettable vacation. On the days we are at sea attend the Legacy Family Tree genealogy classes and learn the real secrets to becoming an expert with Legacy and improving the way you do your research. Go home with the knowledge and tools you need to be more successful. You will be learning directly from the experts. Vision of the Seas, like all Royal Caribbean ships, has cabins that have been designed with a spacious look and the ship’s public spaces are especially airy and bright. Radiance has 87 suites, including an Owner’s Suite, a Royal Family Suite Grand Oceanview Suites and Superior Oceanview Suites. There are 231 private balcony cabins, 496 ocean view cabins, and 327 inside cabins. Vision-class amenities include TV with closed-circuit and pay-for-view movies, safe, individual temperature controls, mini-bars, and hair-dryer. The ShipShape Fitness Center & Spa has a full menu of revitalizing treatments and equipment for burning off calories. Workout areas have recumbent Life Cycles, Textrix step machines and virtual bikes, along with Cybex strength machines, treadmills, saunas and steam baths. The 35-person aerobics area has wrap-around windows for spectacular ocean views. There’s also Ping-Pong and Volleyball. Vision of the Seas has beautiful onboard amenities too. There's the very soothing Day Spa, two pools, six whirlpools, and the Masquerade Theatre, which features nightly entertainment, like contemporary musical stage productions. And that's just the beginning of your cruise vacation. Airfare, gratuities and optional tours are extra. To reserve a cabin, or ask questions, contact our travel agency, Trekalot, at 1-888-505-6997 or send an email to info@trekalot.com. For class descriptions, frequently asked questions, descriptions of the places we'll visit, or pictures of our past cruises, visit http://www.legacyfamilytree.com/CruiseInfo_2012.asp. Learn how to use Google Forms which is part of Google Docs - a free application complete with spreadsheets, word processing and more - to your advantage. While a basic understanding of Google Docs is not necessary, it helps if you know how to access the Google Docs program (see the Google Docs for Genealogists webinar recording). We'll cover how to create new forms, how to add templates, how to embed forms in blogs and websites, how to share forms, and how to be notified each time a form is competed. Join webinar host Geoff Rasmussen and speaker Thomas MacEntee (author of Google for Genealogists, Backing Up Your Genealogy Data, Building a Research Toolbox, Dropbox for Genealogists, and Google Docs for Genealogists) for this 90-minute free webinar, Google Forms for Genealogists. The live webinar is scheduled for Wednesday, June 1, 2011, so register today to reserve your virtual seat. Registration is free. Friday, June 3, 2011. Cruising with Legacy Family Tree in 2012 with Christy Downing. Register here. Wednesday, June 29, 2011. Ready, Set, Write! Share Your Family's Story with Lisa Alzo. Register here. Wednesday, July 13, 2011. 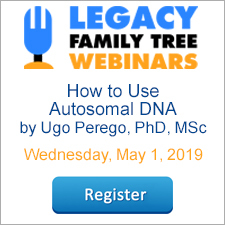 The Power of DNA in Unlocking Family Relationships with Ugo Perego. Register here. Wednesday, July 20, 2011. Google Images and Beyond with Maureen Taylor. Register here. Wednesday, August 3, 2011. Organizing for Success with Karen Clifford. Register here. Wednesday, August 17, 2011. Newspapers for Genealogists with Tom Kemp. Register here. Google for Genealogists by Thomas MacEntee, 1 hour 28 minutes, 4 pages of handouts. Sharing Genealogy Electronically by Geoff Rasmussen, 1 hour 49 minutes, 4 pages of handouts. Chasing Women: Finding Your Female Ancestors, by Leland Meitzler, 1 hour 21 minutes, 4 pages of handouts. Blogging for Beginners with DearMYRTLE, 1 hour 30 minutes, 4 pages of handouts. MORE Blogging for Beginners with DearMYRTLE, 1 hour 30 minutes, 4 pages of handouts. Backing Up Your Genealogy Data, 1 hour 30 minutes, 6 pages of handouts. Mapping Software for Genealogists, by Geoff Rasmussen. 1 hour 4 minutes, 4 pages of handouts. Building a Research Toolbox, by Thomas MacEntee. 1 hour 28 minutes, 5 pages of handouts. Dropbox for Genealogists, by Thomas MacEntee. 1 hour 30 minutes, 18 pages of handouts. Preserving Family Photographs, by Maureen Taylor. 1 hour 30 minutes. Google Docs for Genealogists, by Thomas MacEntee. 1 hour 30 minutes, 9 pages of handouts. Watch Geoff Live: Adding a Death Certificate, by Geoff Rasmussen. 1 hour 23 minutes. Watch Geoff Live: Adding a Marriage Record, by Geoff Rasmussen. 1 hour 45 minutes. "We guarantee you’ll find a member of your family within 30 days, or your money back!" One of the fastest growing genealogy sites with over 4 billion searchable names. Enroll with FamilyLink.com today and get this special. 1 Year Subscription. Just $3.95 per month. You save 70% ($47.40 billed as one payment). Click here for more information or to subscribe. "PAF PAL enables you to add United States or USA globally to all appropriate place names at once to a PAF file. Does Legacy provide this feature for my Legacy file?" Make sure there is a checkmark next to Add ", United States"
United States will then be added to all appropriate locations. Free webinar now online - "Watch Geoff Live: Adding a Marriage Record"
"I have been using Legacy for the past four years and learned more in this 60 minutes than ever before" is what one viewer commented about last night's live webinar. The recording of Watch Geoff Live: Adding a Marriage Record is now available in our webinar archives. "Although it's focused on adding a single type of record, the steps involved cover many things: master source lists, research notes, adding relationships, clipboard, etc. The webinars make everything fall in place because Geoff explains his thought process & reasons for the steps. It's great we can ask questions & add comments live." If you could not make it to the live event, the recording of Watch Geoff Live: Adding a Marriage Record is now available to view in our webinar archives. Visit www.LegacyFamilyTree.com/webinars.asp to watch. Own your own copy of Watch Geoff Live: Adding a Marriage Record by purchasing the webinar-on-CD for just $9.95. Click here for more information or to purchase. A great session - exciting, informative, interactive. Geoff is a wonderful presenter. It's so useful to hear him deliberate about information puzzles and sources and 'think out loud' about the data entry process. Absolutely brilliant Geoff. So many light-bulb moments for me and the additional questions I had in my mind as you progressed were resolved for me by student's questions. Great webinar! Love seeing real-life situations and learning how I can apply the techniques to my own work. Great Webinar! Learn a lot just watching Geoff or other presenters "do" in action. Instills ideas of how some collateral things can be done differently - Picture folders, organization of Sources, etc. Very easy to watch and hold attention. Kudoes to Geoff for doing new things, live. I loved the presentation and I learned so much. I watched the webinar on adding a death certificate just prior to this one; it, too, was excellent. I am just beginning to use Legacy software, and I am so grateful for the training CDs and webinars. I have watched the training CDs more than once, and these webinars are great help in reinforcing and developing the techniques. Thank you! I really appreciate the informal presentation - learn so many things beyond adding a marriage record. Although it's focused on adding a single type of record, the steps involved cover many things: master source lists, research notes, adding relationships, clipboard, etc. The webinars make everything fall in place because Geoff explains his thought process & reasons for the steps. It's great we can ask questions & add comments live. This type of presentation is invaluable. Its great to see someone actually enter their data to learn the process of getting the most out of the information included in documents as well as utilizing Legacy Family Tree to the utmost! Wow ... this was EXCELLENT INFO. I have been using Legacy for the past four years and learned more in this 60 minutes than ever before. Cruising with Legacy Family Tree in 2012 - Friday, June 3, 2011. Added images to existing collection. Added records to existing index collection. Added browsable images to existing collection for several provinces, including new images for Bologna and Genova. Added the state of Veracruz. This completes the 1930 Mexico Census! New browsable image collection. Includes passenger lists for the Holland-America Line (Holland Amerika Lijn), which transported numerous refugees from war-torn Europe to the United States prior to 1941. Added index records and images to existing collection (indexes for Tarnow; browsable images for Lódz and Kielce). Added browsable images (Leon and Lugo). By popular demand, "Watch Geoff Live: Adding a Death Certificate" is now available in our webinar-on-CD collection. One viewer said, "this live presentation is the most powerful learning tool you have provided." Click here to purchase the webinar CD for just $9.95. In this webinar Legacy's Geoff Rasmussen will demonstrate what to do with a death certificate as he adds the information to his real, personal Legacy family file. This class was presented live and unscripted, giving attendees a first-hand look at how a professional genealogist analyzes and records information from a death certificate. You will get the insider's perspective of using the Source Clipboard, custom events, what to do with conflicting information, the To Do List, and much more. The complete Question and Answer session is also included. This class was presented to a live webinar (online seminar) audience on May 6, 2011. 1 hour 23 minutes. I REALLY enjoyed this one more than almost all of the other ones. I learned more about how to input information (and what all information I have not been inputting that I should have) today than I have from any other source - videos, webinars, books, etc. We've now lowered our shipping prices by $3 when all you purchase is between 1 and 2 webinar CDs (applies to U.S. and Canada orders only). Our flat-rate shipping prices still apply for everything else - you can add as many items to your cart and the shipping stays the same. Remember our Flash Webinar on entering death records into Legacy a couple of weeks ago (when I gave you just three hours notice)? I've had hundreds of you write in requesting similar webinars for other types of records - marriage, census, obituaries and more. Well, you've got a little more advance notice for this one, and I can hardly wait until next Wednesday to enter these marriage records into my personal family file (they have so many wonderful things - brand new maiden names, parents' names, marriage dates and more). I will wait until then though so you can all join me as I do it live. You are invited to watch live as Geoff (that's me) adds the information to his real, personal Legacy family file. In this live, unscripted session, Geoff will talk his way through adding a marriage record to his ancestor, giving you ideas on how to use various aspects of Legacy Family Tree (linking pictures, using the source clipboard, the To Do List, and likely much more). The live webinar is scheduled for Wednesday, May 25, 2011, so register today to reserve your virtual seat. Registration is free. Download and print the marriage records so you can follow along. If you haven't yet viewed it, watch "Watch Geoff Live: Adding a Death Certificate" in our webinar archives prior to this webinar (but not required). Wednesday, June 1, 2011. Google Forms for Genealogists with Thomas MacEntee. Register here. Google Docs for Genealogists, by Thomas MacEntee. 1 hour 29 minutes, 9 pages of handouts. Today's webinar, Google Docs for Genealogists, presented by Thomas MacEntee, is now in our webinar archives. Webinar attendees wrote, "I didn't realize there was so much to Google" and "I had heard about Google Docs but had never realized how very powerful it is...". Thomas did a superb job teaching how the free Google Docs can aid our organization, research, and backup strategies. If you could not make it to the live event, the 1 hour 29 minute recording of Google Docs for Genealogists is now available to view in our webinar archives. 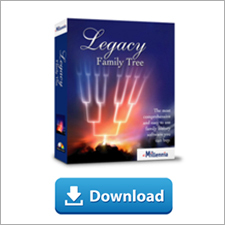 Visit www.LegacyFamilyTree.com/webinars.asp to watch. Own your own copy of Google Docs for Genealogists by purchasing the webinar-on-CD for just $9.95. It includes the recording of the class (1 hour 29 minutes), the complete Q/A session, and 9 pages of handouts. Click here for more information or to purchase. The special discount coupon of googledocs that was announced during the webinar is valid for 10% off anything in our online store through Monday, May 23, 2011. Absolutely fantastic seminar. Always look forward to Thomas' webinars. Great topic, great seminar and I am going right now to play in Google Docs! Thank you very much! As always the Thomas & Geoff team gave a very informative & entertaining presentation. Even though I have used Google Docs for quite some time, I found some new tricks to making the experience more pleasant. Thank you! Excellent presentation, clearly presented in a well-thought out, step by step manner. Very helpful. Great Webinar, I did not realize that Google Docs had all of those features...another tool for the toolbox! I didn't realize that there was so much to Google. He is a great speaker. I had heard about Google Docs but had never realized how VERY powerful it is. My sister and I are researching together while living 1000 miles apart, and the information shared in this webinar is going to open a whole new world of collaboration for us! Thank you! My Society is trying to decide what to do about retaining our files. Google Docs looks like it is our solution. Thanks! The Genealogical Speaker's Guild is looking for feedback from those who have attended virtual presentations (webinars). If you would like to participate in their survey, click here.